This summer, as New Yorkers head out to Long Island’s beach towns and parks on the Southern State Parkway, they’ll pass beneath a series of overpass bridges made infamous in Robert A. Caro’s monumental 1974 biography of Robert Moses, The Power Broker. In one of the book’s most memorable passages, Caro reveals that Moses ordered his engineers to build the bridges low over the parkway to keep buses from the city away from Jones Beach—buses presumably filled with the poor blacks and Puerto Ricans Moses despised. The story was told to Caro by Sidney M. Shapiro, a close Moses associate and former chief engineer and general manager of the Long Island State Park Commission. Caro’s 1,300-page, Pulitzer-winning book is still the definitive account of how Moses, who never held elected office (and never learned to drive), modernized Gotham for the motor age. No figure in U.S. history wielded more power over a city; none better exemplifies the famous epitaph on Sir Christopher Wren’s tomb at St. Paul’s: si monumentum requiris, circumspice (“if you seek his monument, look about you”). Fifty years after Moses left the stage, millions daily still use his parks, playgrounds, bridges, tunnels, and expressways. It is simply not possible to spend more than a few hours in New York without being exposed to the vast legacy of this latter-day Trajan. Lives of such titanic scale and complexity require equally mammoth biographies. They also demand pithy takeaways—kernels so densely representative that they can stand for the whole. The low-bridge story is a microbiography of Moses, a tragic hero who built for the ages, but for a narrowly construed public. It also shows how something as inert as a stone-faced bridge can be alive with politics and meaning. But Moses was complex. He gave Harlem a glorious pool and play center—now Jackie Robinson Park—one of the best public works of the New Deal era anywhere in the United States. A crowd of 25,000 attended the opening ceremony in August, 1936, the 369th Regiment Band playing “When the Music Goes ‘Round and ‘Round” before Parks Commissioner Moses was introduced—to great applause—by Bill “Bojangles” Robinson. And contrary to a claim in The Power Broker, Moses clearly meant buses to serve his “little Jones Beach” in the Rockaways—Jacob Riis Park. While oriented mainly toward motorists (the parking lot was once the largest in the world), it is simply not true that New Yorkers without cars were excluded. The original site plan included bus drop-off zones, and photographs from the era plainly show buses loading and unloading passengers. “Bus connections with the B.M.T. and I.R.T. in Brooklyn,” reported the Brooklyn Eagle when the vast seaside playground opened 80 years ago this summer, “make the park easily accessible to non-motorists.”Further complicating the bridge story is the history of the American motor parkway. The Southern State, begun in the summer of 1926, was not as boldly inventive as Caro and others have claimed. It was, rather, copied whole-cloth from several prototypes in Westchester County. The Bronx, Hutchinson, and Saw Mill River parkways were all either completed or under construction when Moses began planning the Southern State. These were revolutionary roads—set in broad park-like reservations, with grade-separated intersections and access limited to interchanges. They were among the first modern highways in the world, emulated far and wide. When Moses created the Long Island State Park Commission in 1924, he naturally turned to Westchester for guidance. He even tried to recruit the design genius behind its vast park and parkway system—Gilmore D. Clarke.Clarke agreed to be a consultant, which is why the Southern State—the first Moses parkway on Long Island—is nearly identical to those Clarke laid out north of the city. Right down to the bridges. Low-slung and clad in ashlar stone, the bridges were essential to parkway stagecraft—part of a suite of details meant to create a sense of romantic rusticity. The parkway was just that—a way through a park. It was designed to both literally and figuratively remove you from the city, a Central Park for the motorist. Berms and lush plantings screened off-site views disruptive of the reverie, creating an almost cinematic impression of driving through a vast pastoral landscape. As leisure and recreation infrastructure—park before way—commercial traffic was excluded on all the early American parkways. This meant not only trucks, but buses. Banning big, noisy commercial vehicles was essential to the aesthetics of the parkway, and had nothing to do with racial discrimination. There would have been no need to use the bridges on the Southern State as barricades of a sort; buses were not allowed on this or any other state parkway in the first place. But Moses was no fool. “Legislation can always be changed,” Shapiro told Caro; “It’s very hard to tear down a bridge once it’s up.” So did Moses use cement and stone to effectively backstop the vehicular exclusion policy, insuring that the Southern State could never be used to schlep busloads of poor folk to Jones Beach? I decided to test this by comparing bridge clearances on the Southern State to those on the three earlier Westchester roads. Mengisteab Debessay, an engineer with New York State Department of Transportation, directed me to a database of bridge clearancesstatewide used for route planning—thus sparing me a time-consuming windshield survey. A measure of the minimum height between the pavement and the bottom of the overpass structure, clearances tend to change only modestly with road resurfacings. Unless a bridge is upgraded or replaced, clearances remain stable over time.Limiting my search to only those arched stone or brick-clad structures in place or under construction when Moses began work on the Southern State, I recorded clearances for a total of 20 bridges, viaducts and overpasses: 7 on the Bronx River Parkway (completed in 1925); 6 on the initial portion of the Saw Mill River Parkway (1926) and 7 on the Hutchinson River Parkway (begun in 1924 and opened in 1927). I then took measure of the 20 original bridges and overpasses on the Southern State Parkway, from its start at the city line in Queens to the Wantagh Parkway, the first section to open (on November 7, 1927) and the portion used to reach Jones Beach. The verdict? It appears that Sid Shapiro was right. 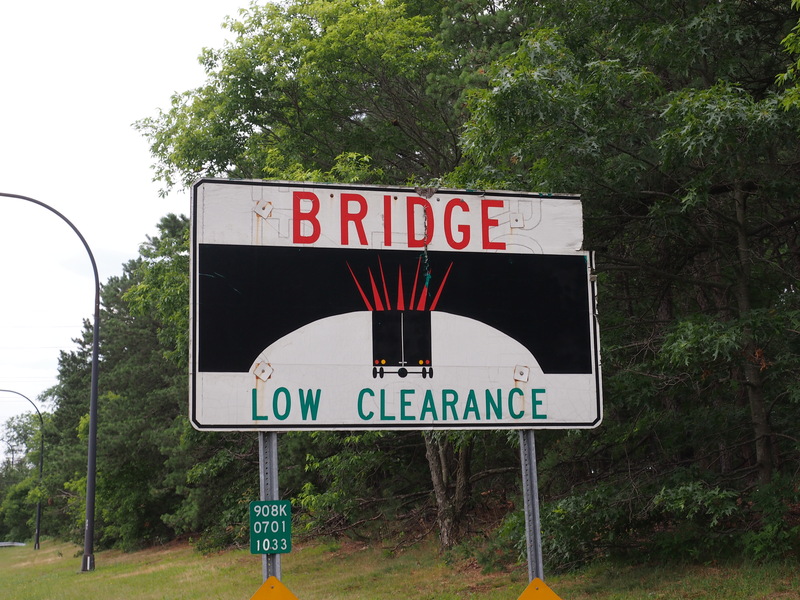 Overall, clearances are substantially lower on the Moses parkway, averaging just 107.6 inches (eastbound), against 121.6 inches on the Hutchinson and 123.2 inches on the Saw Mill. 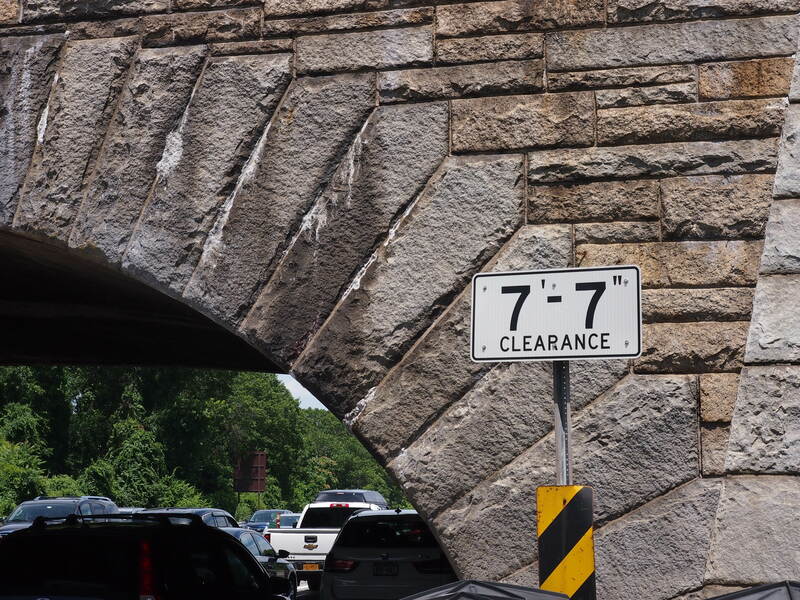 Even on the Bronx River Parkway—a road championed by an infamous racist, Madison Grant, author of the 1916 best seller The Passing of the Great Race—clearances averaged 115.6 inches. There is just a single structure of under eight feet (96 inches) clearance on all three Westchester parkways; on the Southern State there are four.There are today, of course, many routes to Jones Beach. The Southern State Parkway is still the swiftest and most scenic, for all its crazed drivers and constant commuter traffic. It is also a monument to a brilliant, misguided soul, a man whose works are part of every New Yorker’s life, who’s own life was dedicated to serving a public whose constituents he mostly loathed. At a bend in Hudson Avenue, across from the Brooklyn Navy Yard, there is a manhole cover that once lay just outside my grandparents’ grocery store. It is the last trace of a block of long-gone shops and stores straight out of an Edward Hopper painting. In my refrigerator sits another keepsake of this lost place — a quarter-wheel of cheese saved after the store closed in 1941. That anything as perishable as cheese should survive 75 years is remarkable, and so is the tale it tells. My grandfather, Giovanni Tambasco, opened his store at 96 Hudson Avenue shortly after bringing his wife, Raffaela, from Italy in 1924. He had chased work all over the continent since coming to America in 1906 — laying railroad track in California, excavating the New York State Barge Canal, cutting glass in a Brooklyn factory — and it was time to settle down. The couple lived in a room in the back of the store. Raffaela minded the counter; Giovanni stocked the bins and shelves twice a week, wheeling a cart to Wallabout Market at the crack of dawn. 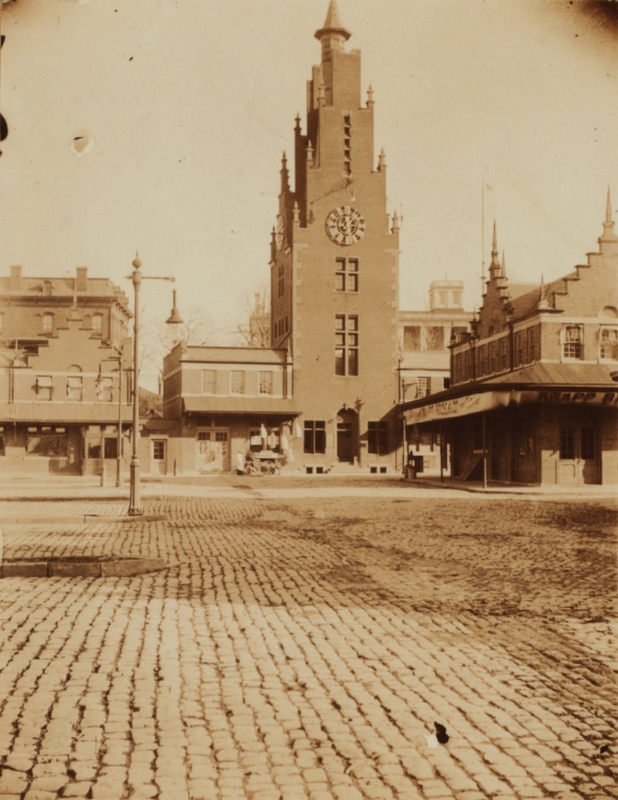 With its Flemish-style buildings and teeming Farmer’s Square, Wallabout was the busiest produce market in America. Nearly everything there came from truck farms on Long Island and the rural fringes of Brooklyn and Queens (we were all locavores then). From an importer off Flushing Avenue, Giovanni bought olives, oils and cheese. The store’s patrons were Poles, Lithuanians and Italians who labored in nearby factories and the Navy Yard. 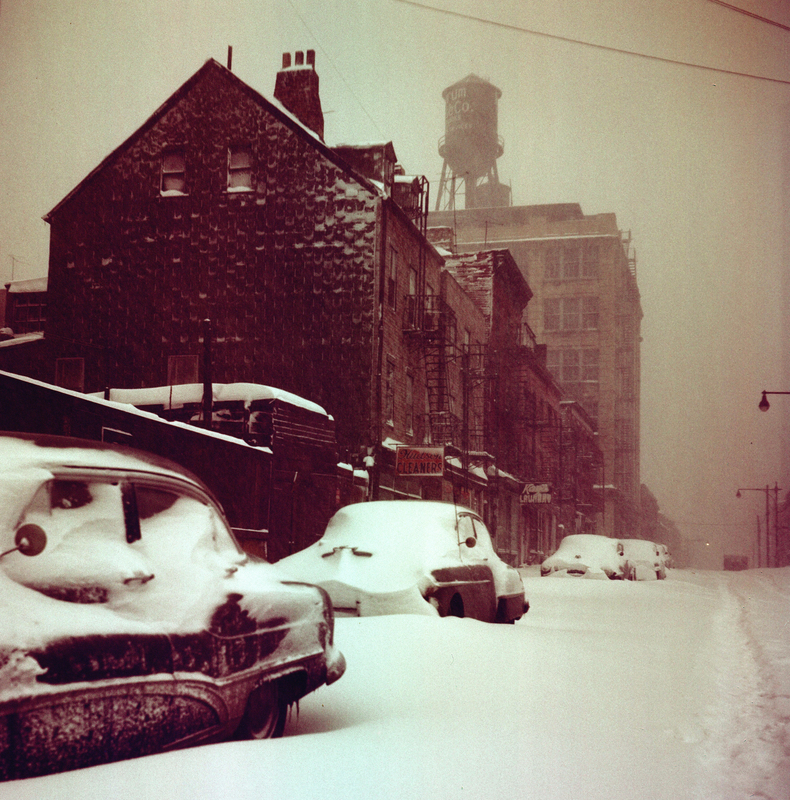 The Fifth Ward, as the area was then known — “Vinegar Hill” was not revived until the 1980s — was gritty, tough and dangerous. This was a place nobody boasted about, where the mark of arrival was to leave. The main drag, Sands Street, was a gantlet of sailor bars and brothels that only outsiders found charming (“as vivacious as a country fair,” Carson McCullers called it). Gas tanks sat alongside tenements. The smokestacks of the huge Hudson Avenue steam turbine plant loomed overhead. When its great boilers were purged, a drift of fly ash and soot would soon settle over the neighborhood. “Pull in the wash!” the women cried. Children donned newsprint hats and listened to the cinders fall on them. My grandparents’ store made it through the Depression only to fall victim to war. 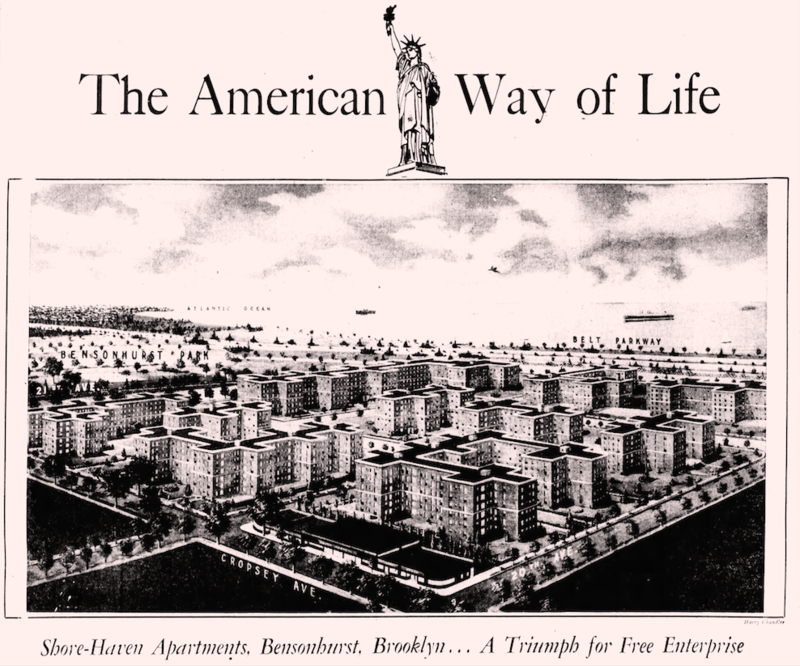 In 1941, work began on the Fort Greene Houses, a massive and ambitious public housing project. Built for families living in the slums south of the Navy Yard, most of its units went instead to servicemen and defense workers. This should have brought a flood of new customers to 96 Hudson Avenue, but two Bohack stores had just opened, one right around the corner. The newcomers preferred the self-serve supermarkets, brightly modern and stocked with a “complete line of nationally advertised groceries.” My grandparents’ store was small and dimly lit, so local that it had neither name nor sign. What ultimately doomed the store was the closing of Wallabout Market. The Navy Yard needed more room, and the market lay in the most obvious path of expansion. Wallabout closed in early 1941. 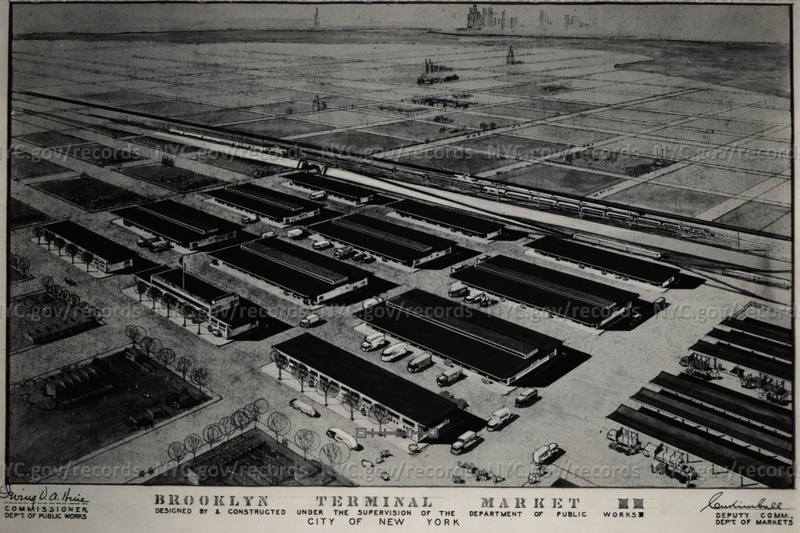 Its replacement, Brooklyn Terminal Market, was in far-off Canarsie. Though Giovanni held a chauffeur’s license, he owned no car. Provisioning the store was suddenly an ordeal. It was shuttered as America entered the war. To make ends meet, Raffaela and my mother, Rose — then all of 15 — stitched dolls’ outfits in a local sweatshop, doing piecework on the side, sewing stars on sailors’ uniforms. My uncle John worked for the baker next door. Giovanni took a factory job. He died the next year from pneumonia after a routine operation. By this time, much of aging Downtown Brooklyn was in the hands of Robert Moses. Century-old buildings were razed for Cadman Plaza and the Brooklyn Civic Center. 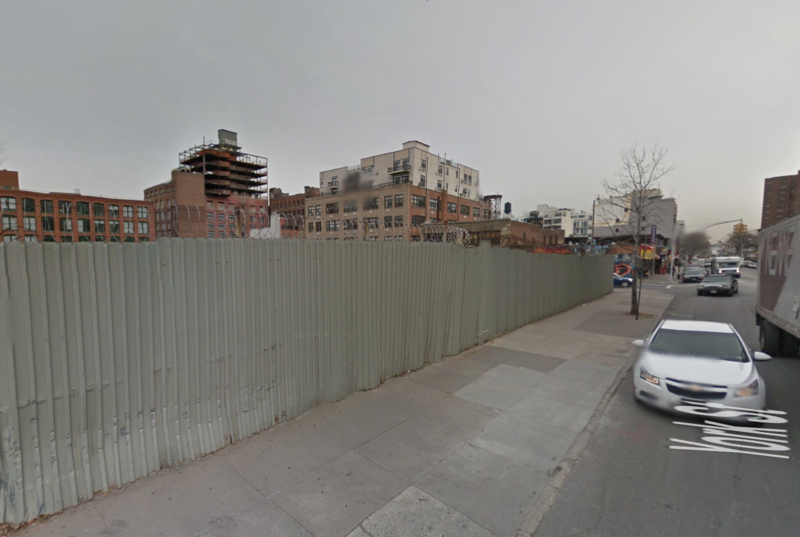 The Brooklyn-Queens Expressway carved a path of destruction toward Williamsburg. Another fleet of Corbusian towers, the Farragut Houses, stamped out the blocks around Sands Street. Some people were forced from their homes, and others fled as racial tensions rose and the social fabric frayed. Raffaela stood her ground and befriended all, earning her keep cooking meals for the Brooklyn Edison men. Then a letter came: 96 Hudson was to be razed to make way for a new public school. Raffaela moved to Bay Ridge with her son. In her modest cache of belongings was the cheese, nearly a full wheel then. The family used it only sparingly in the years that followed. The cheese became a memento and then a memorial after Raffaela died in 1974. When my uncle gave it to me last year, I found a note that read, “Added virgin olive oil, September 11, 1998” — the anniversary of Raffaela’s death. By then, John, an urbane bachelor, had left the city for New Jersey. There had been muggings and a murder on his Bay Ridge block, and his apartment had been broken into. Reluctantly, he moved to a retirement community in Toms River. The cheese went with him. He turned 90 last year. Shedding possessions, he handed me the cheese as my wife and I were heading out the door after a visit. We had recently moved back to New York; the cheese was heading home. We mark ourselves by what we choose of our past to shield from the churn of change. Much of this, whether an old building or historic landscape, is lasting and durable by definition. That something as soft and perishable as cheese should make it across 75 years of time and space, outlasting brick and mortar — indeed, much of the city — is beyond remarkable. But is a cheese from the age of steam still recognizably cheese? Is it even still edible? 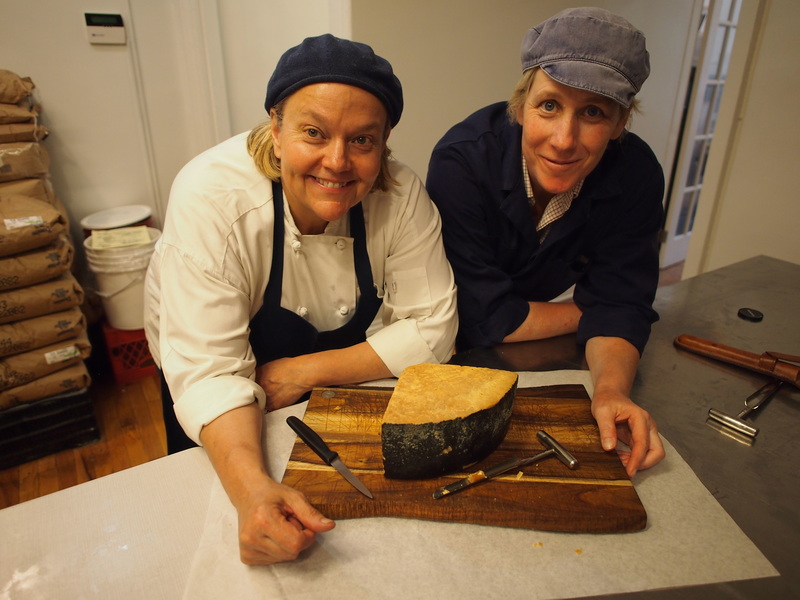 To find out, I took the cheese to Kate Arding and Mona Talbott in Hudson, N.Y. 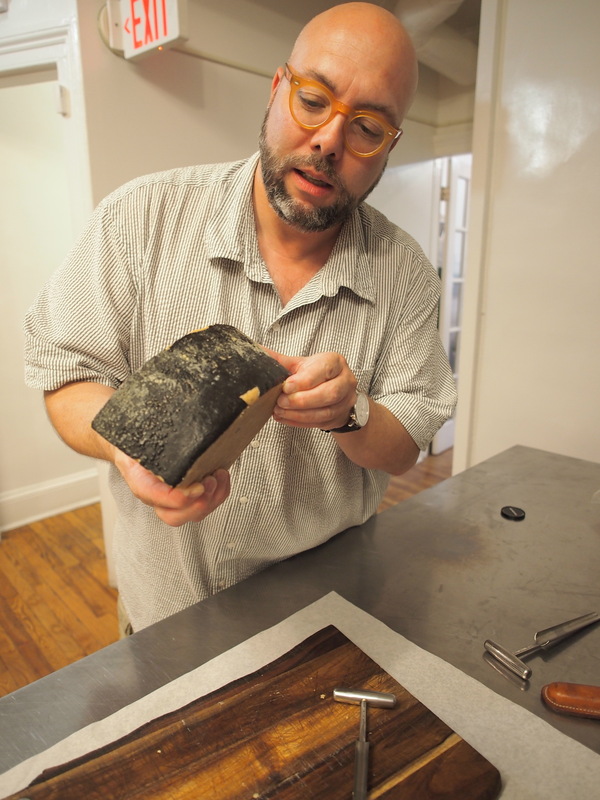 In the kitchen of their lovely shop, Talbott and Arding, we undid its winding sheet. And then there it was: a mottled ginger-gold, velveteen with sweat, edged with a waxy black rind. We were spellbound. Kate took out a device called a cheese trier. Gently rotating it into the rind, she removed an amber sample, like a core of glacial ice. She broke off a small piece and handed it to me. Timidly, I put it in my mouth. I returned to the city with the edible heirloom that was most likely made from the milk of sheep that grazed on the Lazio plain as fascism gripped Italy and Europe descended into war; that crossed an Atlantic harried by U-boats; that dodged the wrecking ball of urban renewal and survived even suburbia; that was finally, safely home. The 2,700-ton Lake Fithian was the most powerful hydraulic dredge in the world in the 1930s. It pumped some six million cubic yards of sand slurry from Rockaway Inlet to fill the Gerritsen salt marshes for an extravagant, ultimately aborted plan for Marine Park—what would have been the largest, costliest urban playground in America. The “mud-chewing monster,” as the Brooklyn Eagle called it, was owned by the National Dredging Company, which previously employed the huge craft to cut flood-control channels on the Mississippi River after the Great Flood of 1927. It was almost certainly also used by Robert Moses to build up the oceanfront at Jones Beach State Park. The Lake Fithian did not begin life as a dredge. The craft was built in 1919 by the Globe Shipbuilding Company of Superior, Wisconsin for the United States Shipping Board, one of scores of “Lakers” built to haul arms to the allies during World War I. It was later acquired by the New Orleans and South American Steamship Company to run the first direct steamer line between the Crescent City and the west coast of South America, sailing via the Panama Canal to Ecuador, Peru and Chile. In 1926 the vessel was sold to William Clifford, who had just patented a technique for converting common cargo vessels into hydraulic or cutter-suction dredges. The drastically altered Lake Fithian, unrecognizable from its former self, was launched a second time in 1927. Clifford’s conversion was likely motivated by the prospect of plentiful dredge work following the Mississippi floods and the ensuing Flood Control Act of 1928. The Lake Fithian was nearly as labor intensive as an 18th-century whaler, requiring no less than 50 hands to make it work. It was essentially a giant sea-vacuum, with a “cutter basket” for a nozzle and suction provided by a 3,500-horsepower steam engine. The elephantine intake snout, armed with a cutterhead, was lowered from a ladder at the front of the ship; aft were a pair of great shafts (known as “spuds”) that were pounded, one at a time, into the bottom. Fixed astern by one of the spuds, the craft could winch itself back and forth from side anchors, grubbing the bottom in a great arc like a famished sea-monster. To make land for Marine Park, slurry was pumped at 20 feet per second through a mile-long cloaca of 30-inch pipe floating on pontoons. At the far end, an unholy pancake of mud rushed over the salt grasses and toward the perimeter dyke. Intredid youngsters frolicked at roaring nozzle, hoping that pirate plunder or “some curious underseas creature might be spewed forth from the huge iron pipes” (others swam along the pontoon pipeline and clambered on board the dredge itself). Overhead, a wheeling, shrieking cloud of gulls gathered to feast on the ejecta, which teemed with doomed sea life; later came snipe—clouds of the long-billed birds descended from out of nowhere to probe for meals. “It’s just too bad that we can’t take our shotguns and have a little sport,” complained a local, who had never seen snipe in the marsh before. Now the birds were “so thick that you could close your eyes, fire a gun into their midst and bag about 50 of ’em.” The Lake Fithian worked the bottom of Rockaway Inlet 24 hours a day from July to November, 1931, smothering what had been a primeval estuarine landscape under 14 feet of sand. At night, the snorting beast was set glow by its boiler fires, a flat-water Pequod tending a slurping try-works. By Thanksgiving the vessel had pumped enough sand to bury 500 football fields nearly six feet deep, or make sandboxes out of 1,840 Olympic-size pools. The craft helped create additional city parkland at Dyker Beach the next spring, pumping slurried mud from a shoal off Bay Ridge through a 17,000-foot run of pipe—the longest ever attempted at the time. By fall, 1960, the vessels were working the Noorpur Reach below Falta Point, a run of river known for treacherous currents. At about eight o’clock on the evening of November 18, the Lake Fithian’s captain cut the engine to make a repair; most of the crew went below for dinner or a game of cards. Some 30 minutes late, the port (left) cable winch failed, causing the vessel to swing starboard with the river current. At just that moment a massive tidal bore reached the aged vessel, striking it broadside. As it leaned, the massive boilers broke free of their mounts and fell. their tremendous weight capsized the Lake Fithian within minutes. 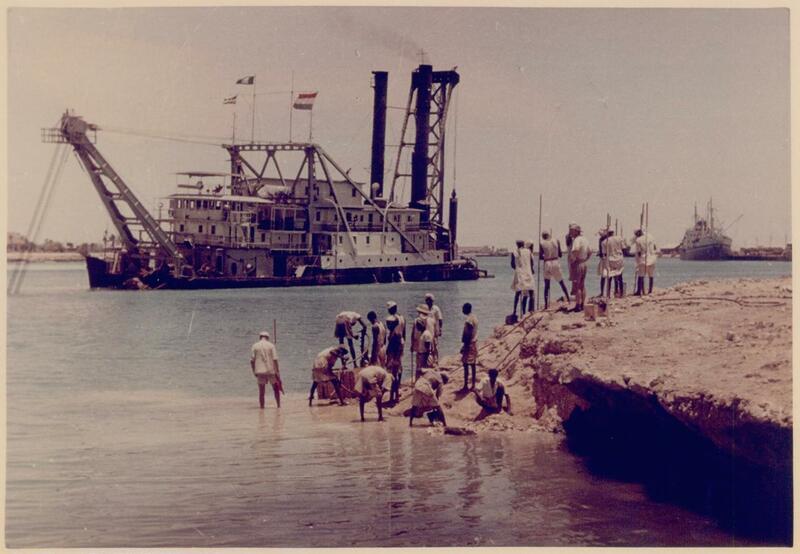 Seventeen men—five Indians and 12 Dutch nationals —were trapped in the hold and drowned. The fast-flowing Hooghly quickly covered its deed, scouring a deep depression around the sunken vessel and burying it in silt. The wreck was not recovered for months; the body of one of the Dutch seamen was never found. Rumors spread that ABM deliberately positioned the age, heavily insured Lake Fithian on the most dangerous part of the river, while the company’s prized new Queen of Holland was kept out of danger. At the playgrounds along Gerritsen Avenue today, a misplayed ball will tumble off court and into the sand, coming to rest alongside on sand and muscle-shell fragments sucked up from the deep a lifetime ago, by a vessel that ended its days 8,000 miles and a world away from its Great Lakes cradle. “Kids Swarm to Marine Park Dredge Scene,” Brooklyn Daily Eagle (23 July, 1931). “Marine Park Made Paradise for Snipe,” Brooklyn Daily Eagle (3 August, 1931). Snipe are notoriously difficult to shoot, hence the origin of “sniper” to describe a marksman of particular skill. Tenth Annual Report of the United States Shipping Board (Washington: GPO, 1926), 90; “Ramp met ‘Lake Fithian is niet helemaal een geheim…” De Waarheid (17 December, 1960). Fred C. Trump, Donald Trump’s father, was the biggest residential developer in Brooklyn in the 1930s and 1940s, and one of the most prolific in the United States. He erected thousands of modest row houses and apartment buildings in East Flatbush, Marine Park, Brighton Beach, Coney Island, Gravesend and Bath Beach. His homes were well-built and affordable, largely due to economies of scale. Known as the Henry Ford of housing, Trump applied techniques of mass production to residential construction long before William Levitt and Levittown. His largest projects were always located near rapid transit (a 1941 bus strike convinced him never to rely on surface transit). Trump’s early homes were exquisitely-scaled “brick bungalows” designed in the popular Tudor style, while those built after World War II were exclusively Modernist. His most trusted architects were outsiders to the mainstream profession–“Miami Modernist” Morris Lapidus and Irving Seelig and his partner Harry Finkelstein. The RMS Queen Mary made her last transatlantic voyage in September, 1967. By then the ship had schlepped two million passengers nearly four million miles back and forth across the North Atlantic. 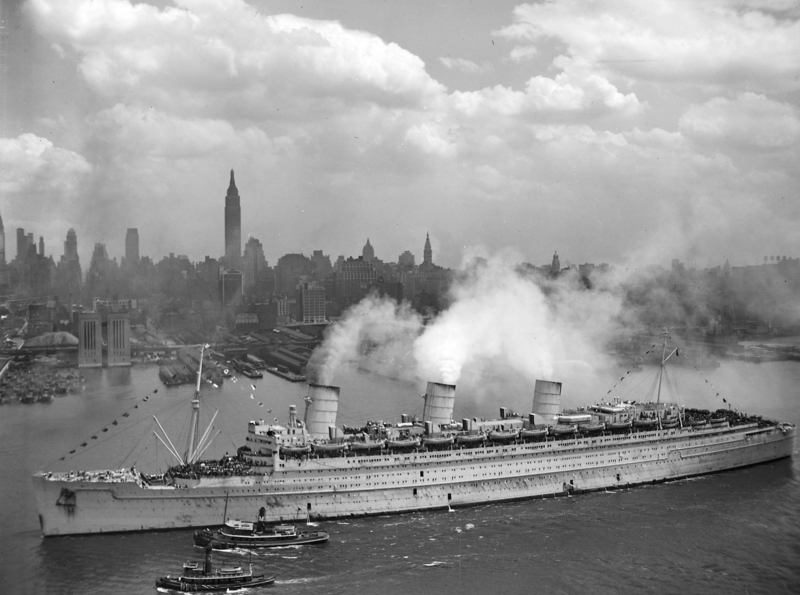 As long as the Chrysler Building is tall and once the fastest ocean liner in the world, the fabled ship would become—what else?—a floating high school in Brooklyn—the HS Queen Mary. That, at least, was what the still-fresh administration of Mayor John V. Lindsay envisioned for the boat. Lindsay knew ships: he had rushed his studies at Yale to join the Navy at the start of World War II, serving as an officer on the destroyer USS Swanson. 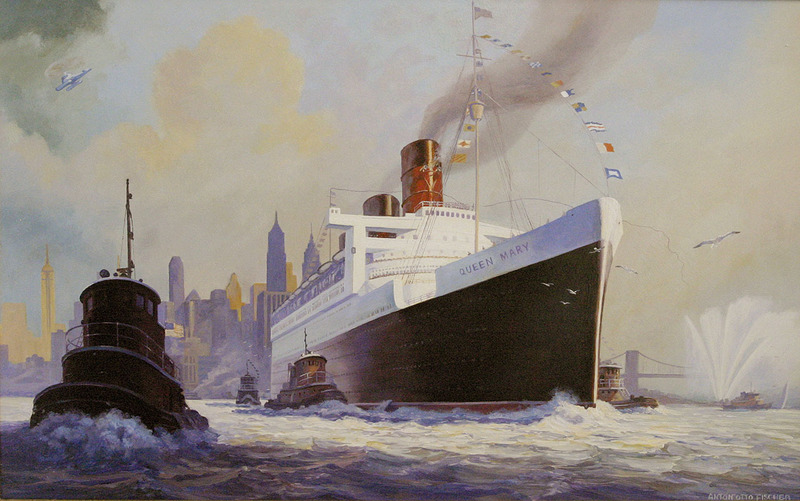 In the spring of 1967, the inimitably-named chairman of the Cunard Steamship Company, Sir Basil Smallpiece, announced that the Queen Mary would be auctioned with a starting bid pegged to its scrap value of $1.82 million. In our present age of dwindling resources and lean economies, its seems incredibly wasteful to junk a ship barely 30 years old—half the age of our still-working B-52 bombers. But the ship was reportedly losing $2 million a year for Cunard, as the nascent airline industry cut deeply into the transatlantic travel trade. Gotham had plenty of competition for the craft. Some 300 bids for the Queen Mary were received from around the world, along with hundreds more suggestions for repurposing the ship. An Australian investor proposed converting the vessel for the emergency transport of immigrants. An Atlanta, Georgia businessman sought to make the ship a traveling trade fair—a kind of mercantile Noah’s Ark upon which would be stowed “everything that’s manufactured in the U.S., if we can get it aboard.” By the end of July, Cunard had trimmed the list of prospective bidders down to 18. New York was still in the running. However unorthodox a means of procuring a new city school, the idea was not as nutty as it seems. Converting the vessel into a “general comprehensive high school”—for 3,000 students from Williamsburg and Bedford Stuyvesant—was estimated to cost $3 million and take about 18 months. A conventional high school would require $10 million and at least four years to construct, assuming a suitable city-owned site could be found. The New York Times called the floating school “Lindsay’s Ark,” praising plans for this “almost instant school.” Admitting there was “an ocean of difference between a luxury liner plowing the seas and a high school in Brooklyn,” turning the Queen Mary into a ship of learning was just the imaginative stroke needed to awaken “a far too conventional city and school bureaucracy.” “The tradition-bound planning of obsolete schoolhouses for the nation’s cities,” it opined, “must be replaced by functional and forward-looking buildings”—retrofitted ocean liners included. But it was not to be. New York was outbid by the City of Long Beach, California, which wanted the ship for a maritime museum and hotel. Instead of deadheading an empty ship to Long Beach, Cunard sent it on a last-fling cruise—with 1,200 passengers “full equally of gaiety and champagne and nostalgia”—to the Canary Islands, Rio de Janeiro, around Cape Horn to Valparaiso and Lima and Acapulco and on up the California coast to San Pedro Bay. The last voyage, ironically, was hugely profitable. The Queen Mary has been in Long Beach for nearly 50 years now, resting in an artificial lagoon at the mouth of the Los Angeles river, idled far longer than it cruised the high seas. 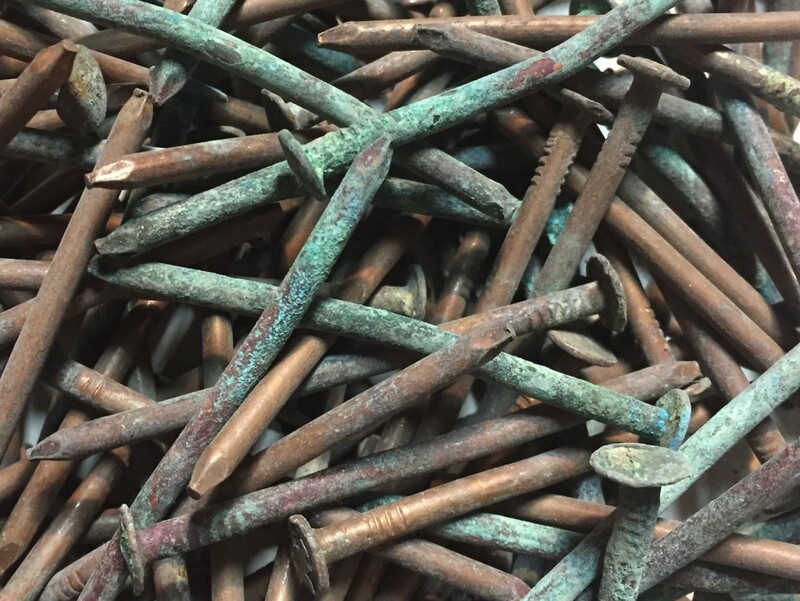 I was cleaning the workshop this weekend and came upon these copper ten-penny nails, patinated to a lovely shade of green. We don’t generally expect history to dwell in something as ordinary as a nail, but these have a tale to tell. They were salvaged by my grandfather, who had a small grocery store at 96 Hudson Avenue in the 1930s, across from the west wall of the Brooklyn Navy Yard. He provisioned the place several times a week by wheeling a large cart to nearby Wallabout Market, where truck farmers from rural Brooklyn, Queens and Long Island hawked their produce (incidentally, the term “truck farm” derives from the French troque, to barter or trade, and has nothing to do with motor vehicles). Offended by waste in any form, my grandfather would gather the broken crates scattered and left behind in the fog of trade. Back home, he would pry out the nails that held the crates together, tapping and hammering each one straight and bundling them in little butcher-paper packets tied with string. Wallabout Market occupied a narrow 50-acre site just above Flushing Avenue, between Wallabout Bay and the old Naval Hospital. It plugged into the city grid via Washington Avenue, which extended north into Williamsburg and south to Prospect-Lefferts Gardens, where it merged with Flatbush Avenue. 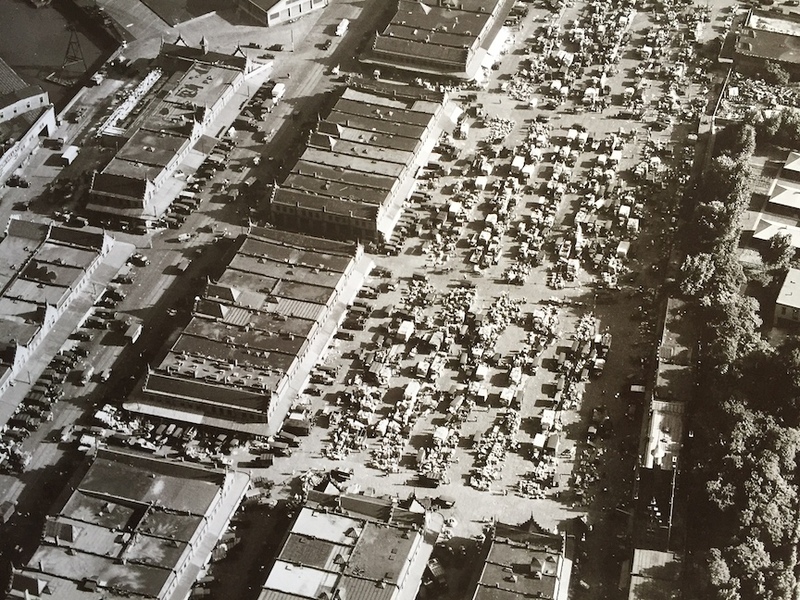 The market’s origins date back to the 1880s, when residents of downtown Brooklyn began voicing opposition to the farm wagons that traditionally parked along lower Fulton and nearby streets to sell their goods. In September, 1884, city hall passed an ordinance banning such wagons from stopping along any thoroughfare other than Washington Avenue at Wallabout Bay. There, reported the Brooklyn Eagle, the city promised “a warm welcome from the people, a well lighted street, with suitable police protection, together with the earnest endeavor of the authorities to provide . . . a market place in some degree worthy of the magnitude of their mutual interests.” To facilitate trade in the interim, a series of wooden shacks and sheds were erected. The loss of Wallabout Market was a tragic one for both cityscape and economy of north Brooklyn. Unlike so many borough landmarks, it was a victim not of urban renewal but war. As the world descended into armed conflict in the late 1930s, shipbuilding at the New York Naval Shipyard (as the Brooklyn Navy Yard was officially known) kicked into overdrive. Space was needed, and the market lay straight in the path of expansion. Tubby’s tower fell to the wrecking ball in the spring of 1941. More than 700 farmers, produce dealers, wholesale grocers and “butter-and-eggs men” were affected by the market’s closure. The expanded Navy Yard became the busiest shipyard in America, churning out an astonishing 17 vessels between 1940 and 1945 (including five aircraft carriers and three of the largest battleships ever built—the North Carolina, Iowa and Missouri. War or not, Brooklynites still needed their vegetables, and so a new produce market had to be built. Sites were considered on Maspeth Avenue in Queens, at Flushing and Cypress Avenues in Bushwick, along Johnson Avenue at the head of Newtown Creek in East Williamsburg, on Linden Boulevard in East New York—where NYCHA’s Linden Houses are today. Eventually the city settled on a still-rural parcel at Foster Avenue and East 83rd Street in Canarsie for its new Brooklyn Terminal Market. Demolition of Wallabout Market was already well underway when a farewell party was held on June 14, 1941. The event was presided over by Navy Yard Commandant Harold V. McKittrick and New York City Commissioner of Public Markets, William F. Morgan, Jr. Taps were played by a Navy bugler, speeches were made. McKittrick apologized to the Wallabout Market Merchants Association for the “patriotic inconvenience” he caused them. 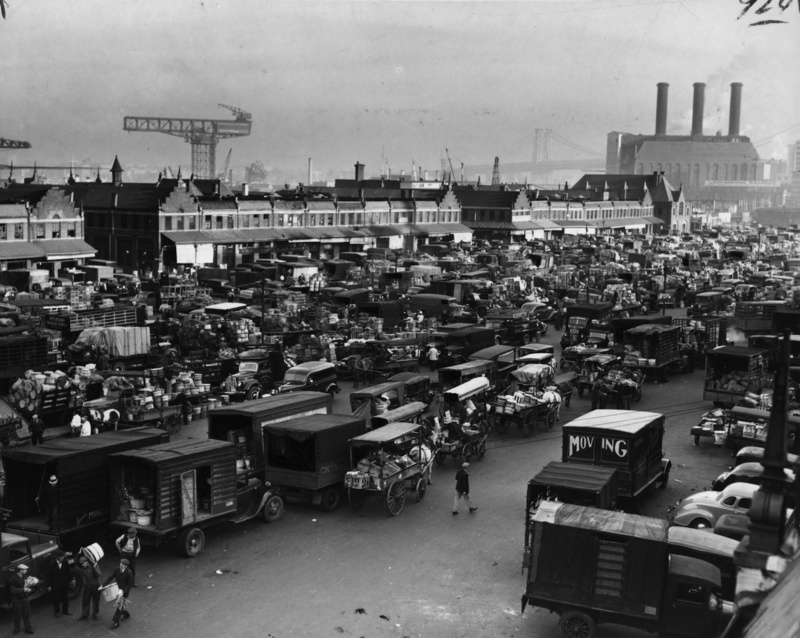 Afterward a “motor cavalcade” of some 500 cars and trucks set out across town for Brooklyn Terminal Market, a symbolic gesture of linkage between past and present, old and new. The United Nations came to Manhattan by way of Queens, and only after sites for its permanent world headquarters were considered as far as San Francisco and the Black Hills of South Dakota. Those shortlisted, however, were all in the Northeast—Philadelphia, Boston, Fairfield County in Connecticut, and “Kykuit,” the Rockefeller family estate near Tarrytown. 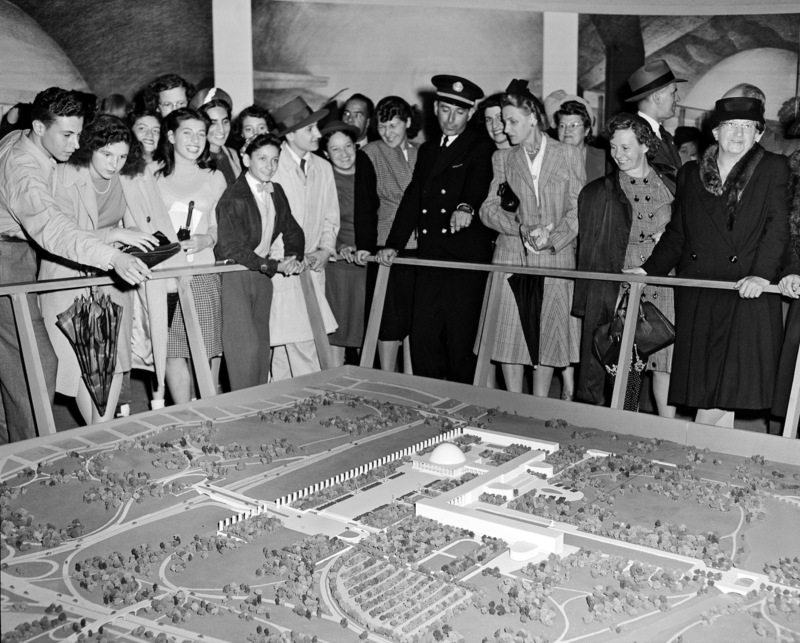 New York City entered the race in late 1945, when Mayor William O’Dwyer assembled a blue-ribbon commission—the Mayor’s Committee on Plan and Scope—to advance the former World’s Fair grounds in Flushing as the best place for the world peacekeeping body. 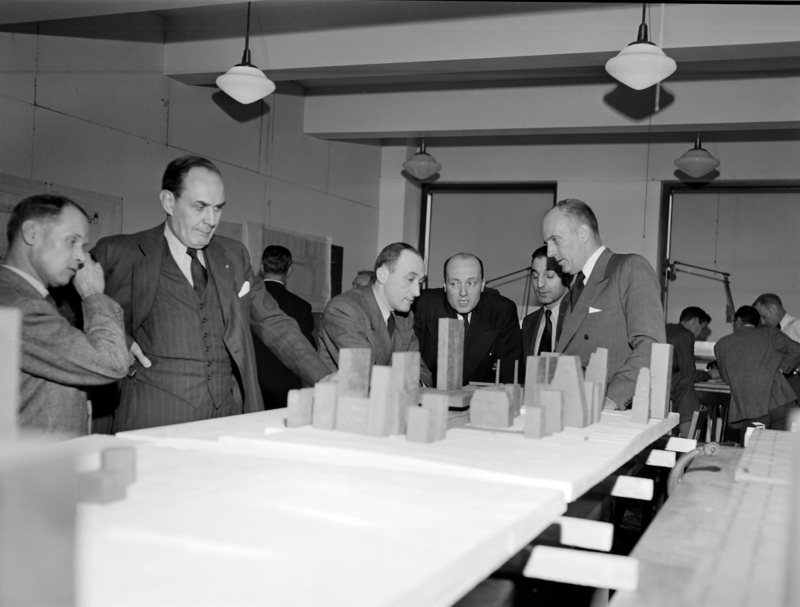 Robert Moses, chair of the Mayor’s Committee and driving force behind the Queens proposal, had already presided over the miraculous transformation of the Flushing ash heaps into the World of Tomorrow; making the old dumping ground the UN’s permanent world headquarters would be a sweet second act. The board members all agreed, and a mighty lot they were—Nelson A. Rockefeller, Arthur Hays Sulzberger of the New York Times, IBM chief Thomas J. Watson, Frederick H. Ecker of Metropolitan Life, political kingmaker and Postal Service boss James A. Farley, the man who helped put FDR in the White House. In an October, 1946 New York Times essay, Moses pronounced New York “the natural and proper permanent home for the United Nations,” with Flushing Meadow Park affording “the acreage and opportunities to build an entirely new, independent, self-contained United Nations city on virgin soil.” The site was ideal in many respects—green and spacious, well-served by new infrastructure, a short drive from Manhattan and only minutes from the city’s main airport at the time (La Guardia Field). Using an approach that worked well in planning the Fair, Moses appointed a Board of Design to produce a vision of what the UN Flushing complex might look like. 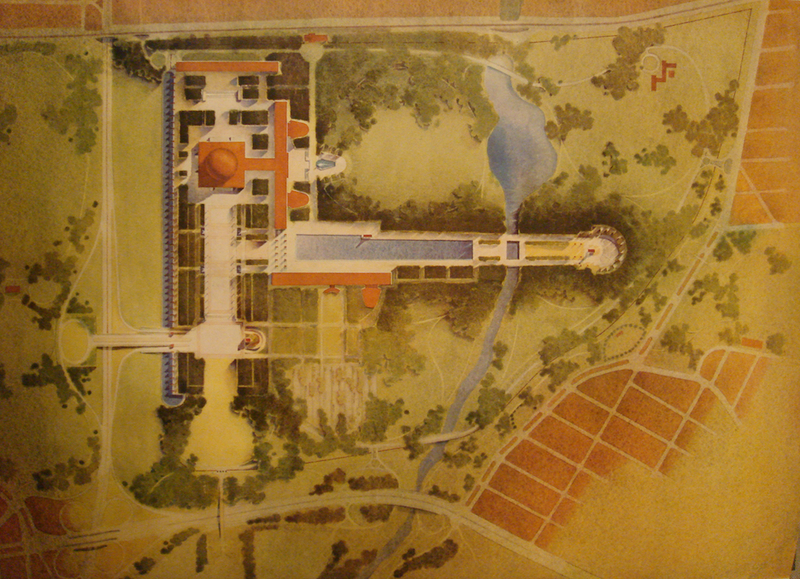 It included Louis Skidmore of SOM; Wallace K. Harrison, designer of the Trylon and Perisphere and one of the architects of Rockefeller Center; and Aymar Embury II, a Moses favorite who created the fair’s New York City Pavilion. Chairing the board was another Moses man, Gilmore D. Clarke. Clarke and his partner Michael Rapuano had planned both the 1939 Fair grounds and subsequent Flushing Meadow Park. No one knew the vast site better. The Mayor’s Committee presented its final report to UN Secretary General Trygve Lie in September, 1946. It was an extraordinary piece of work, with breathtaking perspective sketches by Hugh Ferris and a glorious master plan by Rapuano—a last, late example of the luminous watercolor-wash rendering style developed at the École des Beaux-arts and popularized in the City Beautiful era. The roots of the plan reach back even further. 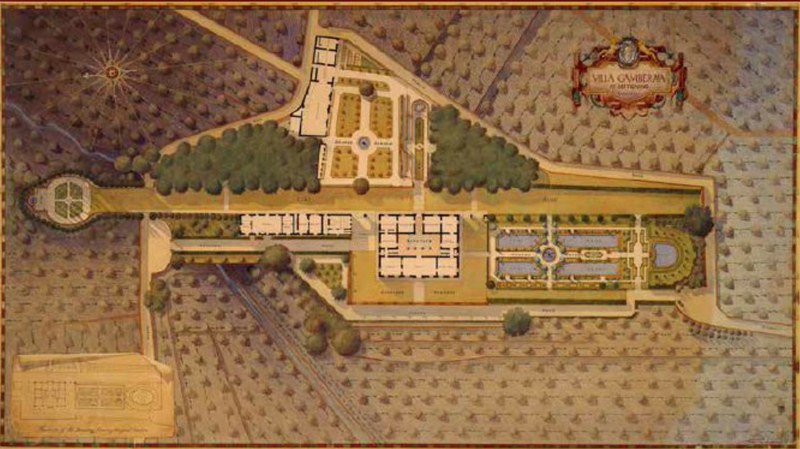 A 1927 recipient of the Rome Prize in Landscape Architecture, Rapuano spent several years studying Italian villas and piazze. His use of an extended axis to organize the UN buildings is reminiscent of a Renaissance space he knew well–the Villa Gamberaia at Settignano, in the countryside near Florence. Rapuano’s mentor at Cornell, Edward G. Lawson, prepared the first measured drawings of the villa while himself a fellow at the American Academy in Rome (for more on Lawson see my 2012 article in Landscape Architecture Magazine, available here). However impressive, the proposal failed to sway the UN’s Headquarters Commission, which balked at the enormous cost for the sprawling campus—some $65 million. A newly arrived French delegate to the Commission, Le Corbusier, dismissed Flushing as too suburban for his tastes. There were rumors, perhaps apocryphal, that delegates themselves dreaded being marooned in outerborough Queens, so far from Manhattan nightlife. Thus Moses was handed one of his rare defeats, even as the UN General Assembly voted to accept his offer to use, rent-free, a refurbished NYC Pavilion as temporary quarters. Of course, both the city and Moses prevailed in the end, when William Zeckendorf, Sr. suddenly made available a 17-acre patchwork of parcels on the East River he had planned to develop into a larger version of Rockefeller Center (Wallace Harrison was to design it). Harrison and Nelson Rockefeller convinced Nelson’s father, John D. Rockefeller, Jr., to purchase and gift the Zeckendorf land to the city for the UN complex. As planning of the East River complex moved forward, Moses made sure his trusted designers were at the center of the effort. Most scholarship on the United Nations complex has focused on the Board of Design Consultants, which included a number of internationally prominent architects—Le Corbusier, Oscar Niemeyer, Sven Markelius and China’s brilliant, tragic Liang Sicheng. But equally influential, if not more so, were Harrison and the so-called Associate Architects and Engineers—”professionals who knew the city,” recalled George Dudley in A Workshop for Peace (1994), who “had the confidence of conservative and ‘modern’ architects, and whose firms could also make personnel available.” Moses and Harrison handpicked three architects to head this team—Clarke of Clarke and Rapuano; Skidmore of SOM; and Ralph T. Walker of Voorhees Walker Foley and Smith. It was immediately after meeting with Moses on in January, 1947 that the UN Secretary General appointed the trio as “associates for the planning of the United Nations Headquarters.” Only weeks later did member nations began forwarding their nominations to the high-profile Board of Design Consultants, and not until February 12 that its first members were approved. Thus the Moses’ men had a solid month’s lead over the Board of Design. Though this latter group—and especially Le Corbusier—would dominate media coverage on the UN project, it was the former, beholden really only to Moses and the Mayor, that held virtual veto authority over any fancy schemes the elite Board came up with. In the end, it was Clarke and Rapuano who quietly determined the final site and landscape plans for the headquarters complex and streets around it. Though it lacks Manhattan’s cache, Flushing would have been a better place for the United Nations in the long run. The Flushing complex would have been just minutes from JFK, with plenty of free parking for all those diplomat-tagged luxury sedans that collect tickets like leaves in an autumn gutter (UN diplomats owe the city some $16 million in unpaid parking tickets). Big UN powwows could take place without costly, congestion-making police escorts and other VIP tie-ups of tiny, crowded Manhattan. And as Manhattan slowly morphs into an isle of the super-rich, it is the oft-scorned outer borough that may well be a better representative of the world in all its richness and color today. With nearly 140 languages spoken on its streets, Queens is the most ethnically diverse place in America and possibly planet Earth. New York has had many memorable park chiefs, from the titanic Robert Moses to the inimitable Henry Stern, with his habit of dressing up as a tree and being “plantedhenry stern.” But in terms of heart, soul and sheer eccentricity, none can top the singular Charles Bunstein Stover. 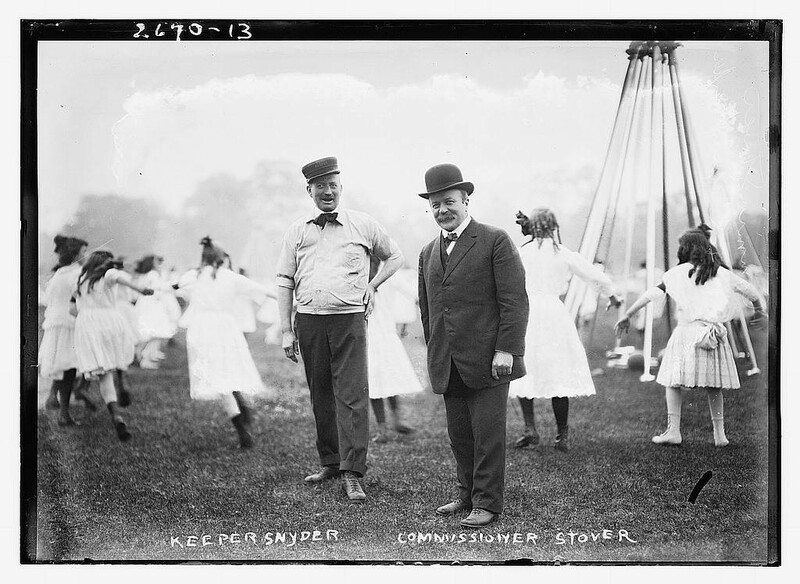 Stover was appointed New York City’s park commissioner in 1910 by Mayor William Jay Gaynor and quickly gained notoriety for a series of baffling disappearances. Shortly before taking office he vanished for six weeks, ostensibly to immerse himself in a study of Italian landscape gardening. When three lion cubs were born at the Central Park Menagerie, Stover dropped out again, shutting himself in his library “with a vast pile of historical lore” and emerging only when he had settled on three good names for the cats—Akbar, Jumna, and Sheba. 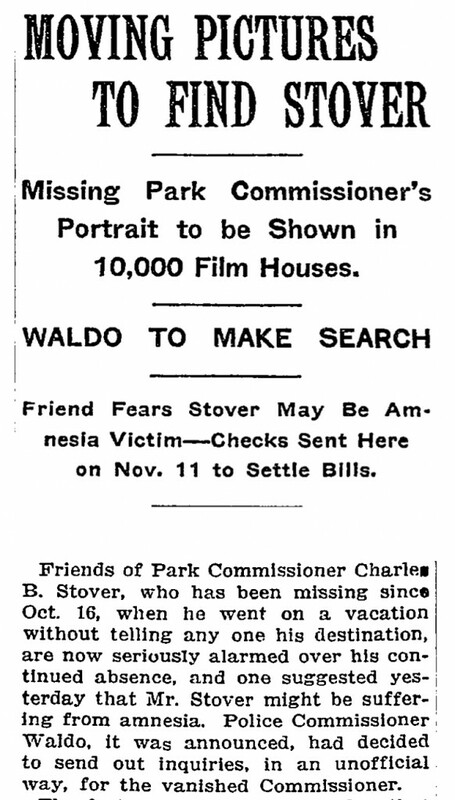 A final vanishing act in October, 1913 so alarmed city officials that footage of Stover was patched together by Pathé Frères and shown in 10,000 movie halls across the United States, in the hope that a patron might have seen him. Speculation ran wild as to where, why and how Stover disappeared. A close friend wondered if the cause was not “a blow on the head or an excess of grief” over the death—from injuries sustained in an assassination attempt—of his beloved Mayor Gaynor. A lead traced Stover to Philadelphia; another suggested he drowned in Wilmington, where a body recovered in the Christiana River bore a “striking resemblance” to the missing commissioner. He surfaced briefly—alive—in New Orleans, but not before a story got out that he had taken up with a missing Chicago alderman at a San Francisco hotel. Then, on January 28, 1914, the peripatetic park chief quietly appeared again in New York, explaining only that he had been touring the South to study its cities. Charles Bunstein Stover was born in Riegelsville, Pennsylvania in July, 1861, the son of a shopkeeper. While preparing for the ministry at Union Theological Seminary he suffered a shattering loss of faith—”a phalanx of terrible doubts,” Stover called it, “like a thunder-crash in the clear heavens.” The experience shook him deeply, plunging him into depression. Redemption came by way of Stanton Coit of the Ethical Culture Society, who convinced Stover to run the Society’s model tenement houses on Cherry Street. Stover eventually succeeded Coit as director of the Neighborhood Guild, the first settlement house in America. The Guild provided immigrant youth sanctuary from the streets, and was meant—in Stover’s words—”to encourage thrift and fellow-helpfulness, to purify and exalt the tastes, to excite opposition to all forms of injustice, and to kindle devotion to the common weal.” Later renamed University Settlement, the institution still exists in the same building at 184 Eldridge Street, where Stover lived—a lifelong bachelor—for 40 years. Its extraordinary list of alumni includes George and Ira Gershwin, Abe Beame and Jacob Javits. The next 20 years were the most productive of Stover’s life. In 1898 he founded the Outdoor Recreation League, which opened “Hudsonbank” in Hell’s Kitchen—the first public playground in an American city (DeWitt Clinton Park today). The League established other playgrounds at Hamilton Fish, Seward, Corlear’s Hook and Mulberry Bend Parks. In 1903 Stover cheerfully proclaimed City Hall “fully converted to the playground idea.” As park commissioner Stover had the authority to make “scientific play” part of every Manhattan park. His Bureau of Recreation opened 30 new playgrounds on the island, launched a program of athletic competitions, folk-dance festivals and pageants, and organized a school garden program 80 years before Alice Waters and her Edible Schoolyards. 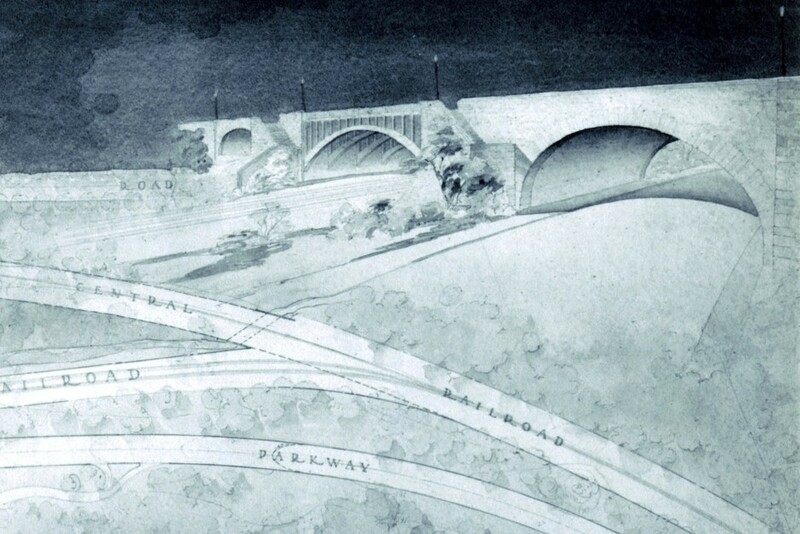 Stover proposed erecting log cabins in city parks to recycle blight-felled chestnut timber and had rock excavate from construction of the Catskill Aqueduct trucked down to extend Riverside Park. He even succeeded in ridding Central Park of poison ivy—temporarily, at least. Nor were Stover’s’ labors restricted to Manhattan: he also helped create Gotham’s first and only public park on the Atlantic. New Yorkers at the turn of the last century had no public beach access to the sea (Coney Island was nearly all in private hands at the time). “We have turned our backs on old Neptune,” lamented Stover, “as if our city stood in the midst of a great continent.” Stover envisioned building a great playground for the people on a stretch of then-remote oceanfront land in the Rockaways; for it was “high time,” he wrote, “for this municipality, like Venice, to go down to the sea and become its bride.” He urged the city to acquire the entire western end of Rockaway peninsula—from Belle Harbor to Breezy Point—while the land was cheap. At 850 acres, Stover’s seaside park would have been equal in size to Central Park. But the city dragged its feet and developers soon snatched up the property, churning much of the peninsula into a warren of cheap bungalows. The acreage eventually secured for what would become Jacob Riis Park—today part of Gateway National Recreation Area—was but a third of what Stover had envisioned. Charles Stover’s advocacy for the public good knew few boundaries. 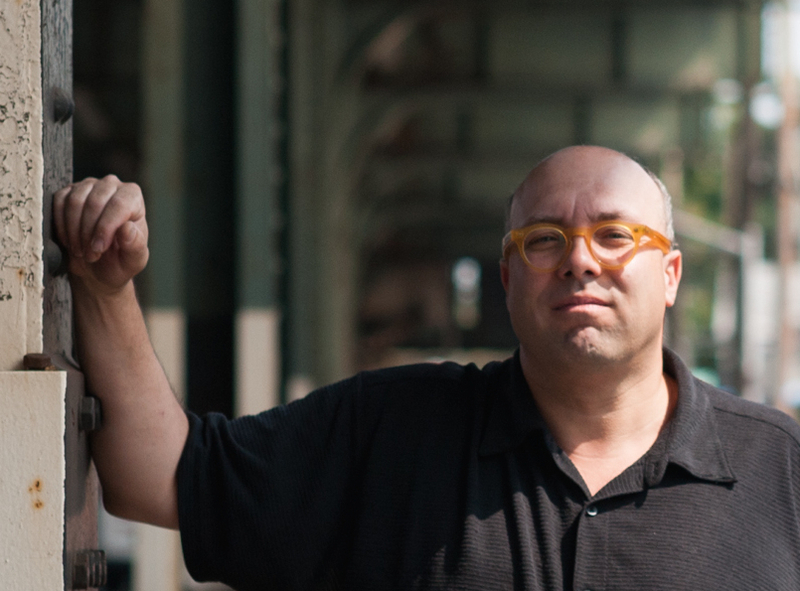 As president of the East Side Civic Club he led a decade-long fight against elevated rail structures, arguing that they plunged streets into darkness and screeching clamor. It is due in part to his labors that New York became the first major American city to make public transit truly public—owned, that is, by the city and its citizens rather than leased to a private franchise. Achieving this was not easy. The Rapid Transit Commission was opposed; the people and their political leaders indifferent. The most forceful broadsides in favor of municipal ownership came from a mysterious Chadwick Civic Club, which most assumed was an august body of leading men. In reality it was just a front for Stover and a handful of his reformist buddies, who gather weekly at a Rivington Street bakery. Stover is largely forgotten today, a status he would likely have appreciated. There are no parks—no playgrounds, even—named after him. He is recalled in the New York only by a memorial “whispering bench,” tucked in a corner of the Shakespeare Garden. It is but a stone’s throw from the Arsenal, headquarters of the Parks Department, a quiet spot in the city where our current Commissioner might well repair upon occasion to seek counsel from his kindhearted, often-absent predecessor. Vinegar Hill in the 1930s was a rough industrial neighborhood just port of the Navy Yard with a main drag, Sands Street, that left many a sailor penniless, inked-up, syphilitic or dead. Bobbing above the bars and brothels were two churches, one around the corner from the other—St. George at 203 York Street and St. Ann on the corner of Front and Gold Streets. Two others—St. Michael the Archangel at Lawrence and Tillary Streets and St. Edwards just off Myrtle Avenue (the latter two eventually merged)—were no more than a 15-minute walk away. Lest one conclude that this was a district of great piety—Sands Street notwithstanding—recall the old cliché about Sunday being the most segregated day of the week. This was still the era of “national parishes,” when each ethnic group worshipped in a church of its own. Vinegar Hill started out Irish—the name recalls the Battle of Vinegar Hill during the Irish Rebellion of 1798. By 1900 the area was drawing a vibrant immigrant mix of Italians, Poles, Czechs and Lithuanians. The groups mixed to some degree, but always with a note of tribal wariness and suspicion. Mostly they mingled, prayed and mated with their own kind, as humans have been doing since the dawn of time. For these strangers in a strange land, the church was as much a cultural sanctuary as a place of worship. Lithuanians were not warmly received at the two Irish churches—St. Ann (above) and St. Edwards—so they built St. George (pictured below), where Italians were tolerated but mass was in Lithuanian. The nearest Italian church was St. Michael the Archangel at Lawrence and Tillary Streets. 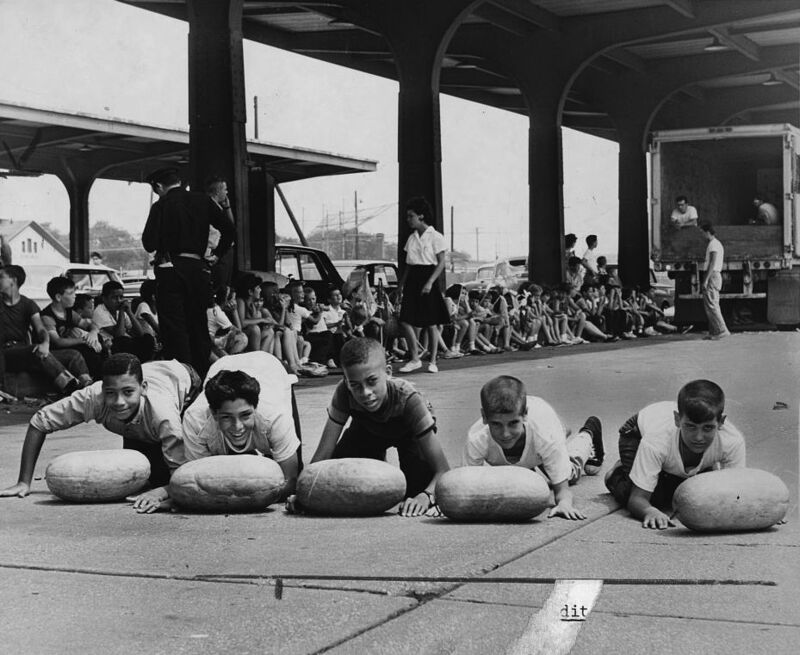 As the hub of old downtown’s Italian community, crowds would gather there every August to celebrate the Feast of the Assumption (“with the enthusiasm of their race,” snarked the Brooklyn Eagle). 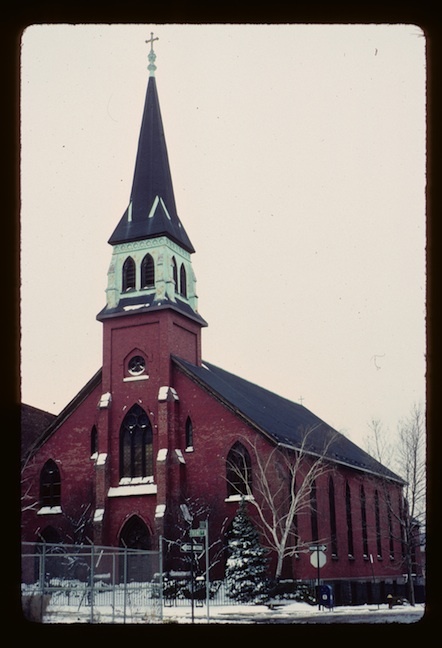 When urban renewal forced St. Michael to close in 1942, the Diocese merged its congregation with that of St. Edwards—a move that went smoothly only because the original parishioners were mostly gone. 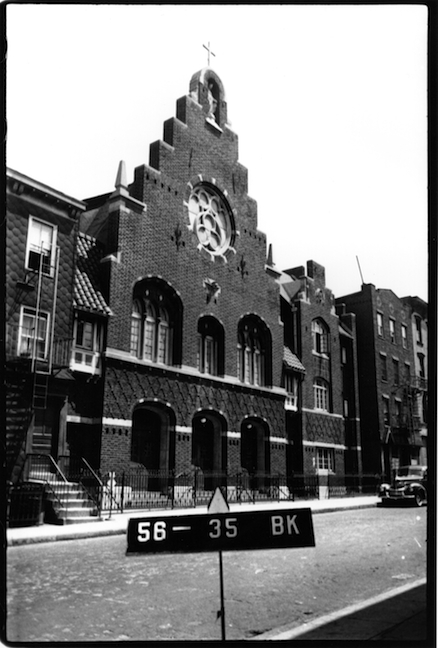 The twin-towered Church of St. Michael and St. Edmund, as it was rechristened, was one of only two buildings left when the neighborhood was razed for a Navy Yard housing complex—today NYCHA’s Ingersoll and Walt Whitman Houses. The Romanesque structure is today the only of the four original Catholic churches still standing, though its days are numbered (it was shuttered in 2010). Religious architecture is vulnerable in a secularizing society, and churches and temples are notoriously difficult candidates for conversion or adaptive reuse. Stories of redemption—like the Villa Victoria Center for the Arts in Boston or the historic synagogue on Norfolk Street operated as an arts and event space by the Angel Orensanz Foundation—are rare. The oldest of the group, St. Ann’s, came down in 1992, replaced by a parking lot. The building was completed on the eve of the Civil War, its first Mass celebrated on Christmas Day, 1860—155 years ago this week. The modest Gothic structure was designed by Patrick C. Keely, an Irish-born architect and Brooklyn resident who created some 700 churches for working-class parishes up and down the eastern seaboard. Among his many commissions were Boston’s colossal Cathedral of the Holy Cross, the largest Catholic church in New England, and the St. Joseph Church at 1802 Tulane Avenue in New Orleans, a century-old landmark in the middle of the gleaming new LSU Health Sciences campus. A rare Keely residence is the William B. Cronyn house at 271 9Th Street in Park Slope. 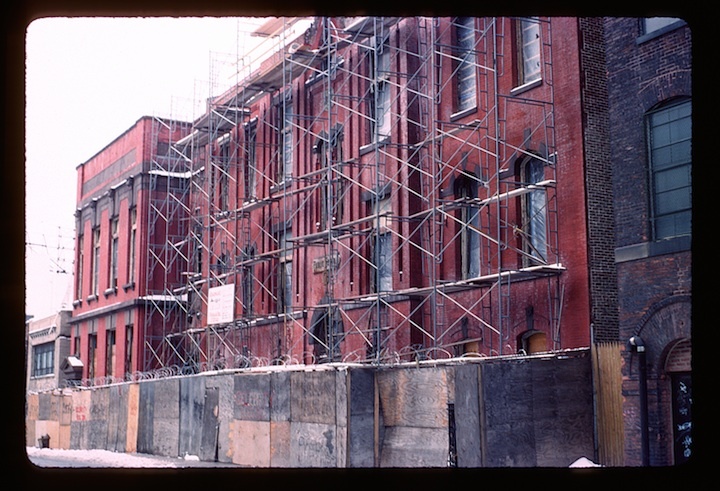 St. George, with its idiosyncratic stepped façade, survived at 203 York Street until 2007. It was evidently razed by the same developer who toppled St. Ann, this time for a 33-unit condominium complex. Perhaps the two saints conspired to cast a spell on the site, for the project was hexed from the start: the developer ran afoul of the Department of Buildings for demolition violations; construction was delayed for years. When the units finally came on the market in 2011, sales were weak—the troubled Farragut Houses across the street were blamed. The building was eventually sold and converted to rental apartments. Zoom in on Google Maps, satellite view, to the block bounded by York, Jay, Front and Bridge Streets in DUMBO and you will see a little mortarboard ghost floating sadly in the middle of a vast parking lot. 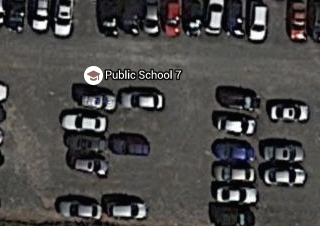 It says Public School 7. It is wrong. The school did once occupy part of the block—the southeast corner—but shut down decades ago and vanished from this world around 1990. Somebody’s database—Google’s or more likely the Department of Education’s—needs updating. 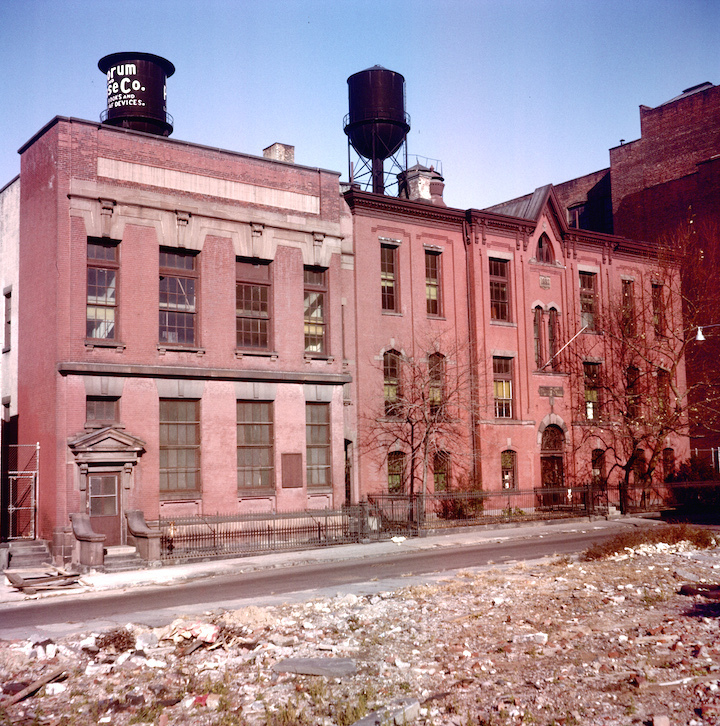 Public School 7 was a fixture at 141 York Street for well over a century, set in a dense block of industrial buildings that included the original Boorum and Pease plant, makers of the ledger books that once ran American business (still available under the Esselte Pendaflex name). Designed by James W. Naughton, buildings superintendent for the Brooklyn Board of Education, the school opened in 1882. In his History of Brooklyn (1884), Henry Stiles described the new building as “one of the best . . . ever erected for school purposes in this country—a structure to which the City can point with justifiable pride.” Expanded in 1907 (the neoclassical building on left in photo below), it was a place of discipline and order in one of the roughest parts of New York City. A 1908 report of the People’s University Extension Society (Jacob Riis, board member), notes lectures that year, in English and Italian, on the prevention of childhood diseases. Al Capone was a pupil at the time. 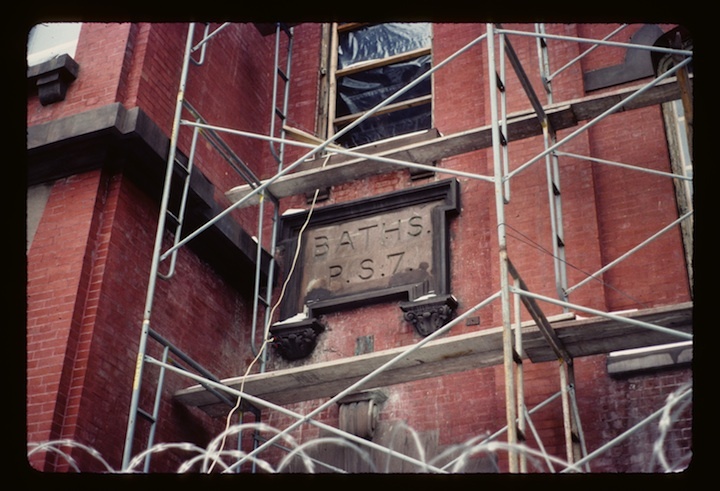 In late 1988, when I took the photos further down on this page, the school had long been shuttered, but was being rehabilitated for housing under the auspices—I believe—of the Brooklyn Union Gas Cinderella program. On a follow-up visit not long after I was shocked to find the building gone. Evidently the entire block was acquired around 1990 by the Watchtower organization of Jehovah’s Witnesses, still among the largest property owners in downtown Brooklyn. The group leveled the block not long afterward, including this little gem (notwithstanding its listing on the National Register of Historic Places). Its been a parking lot ever since, sealed behind a corrugated steel fence topped with concertina wire. 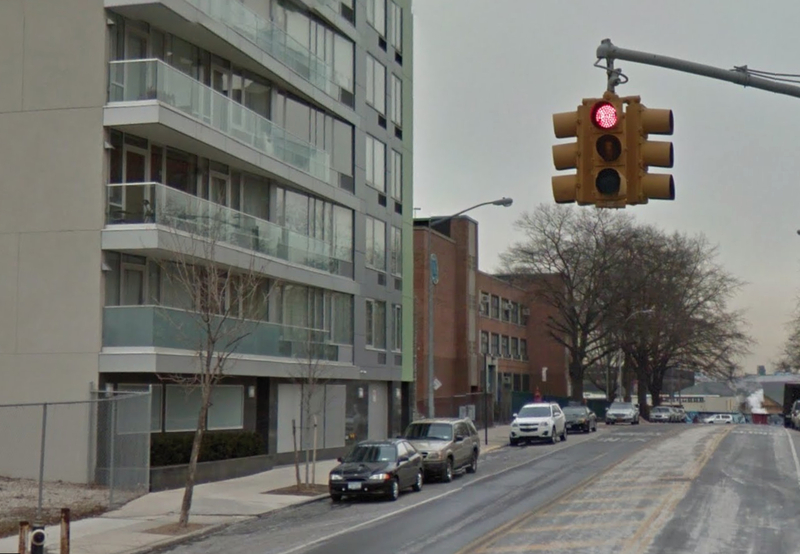 The block just south of York Street here, where the above photo was taken, was blown out decades earlier by Robert Moses to make way for the Brooklyn-Queens Expressway. Only a single structure survived the Mosiach onslaught—an industrial building at the corner of York and Bridge Streets trimmed with colorful glazed terracotta. Erected c. 1909 by the Thomson Water Meter Company, it was later famous as the source of Eskimo Pies, the beloved ice-cream treat of a generation of Brooklyn kids. As for the vast block that was once home to Public School 7 (officially 85 Jay Street)—its been called “the last great site in DUMBO,” with nearly 900,000 square feet of buildable space and a price tag that could run north of $350 million. The property, one of the most valuable and sought-after on the east coast, finally went on the market earlier this month.